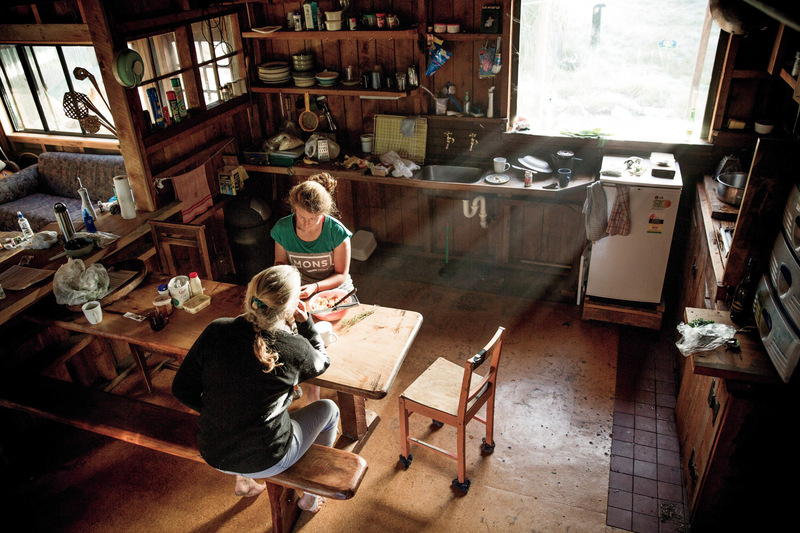 WAY OFF THE GRID The Browns' home, nestled between the Tasman Sea and the western edge of Mt. 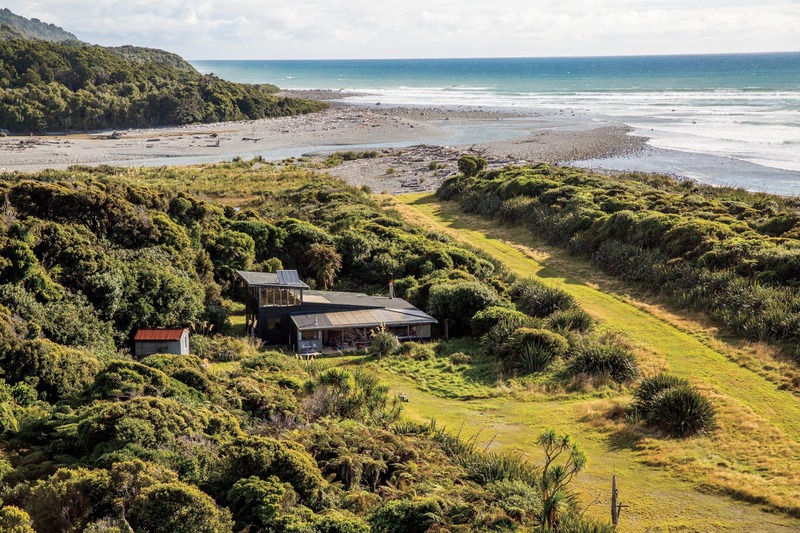 Aspiring National Park, was so far in the bush that they were considered to be the most remote family in New Zealand, and their hut could be reached only by foot or air. The kids’ exposure to the “white-bread world,” as they called it, was limited to stories from passing hikers, heli hunters who used their grass air strip, toys Lou would sometimes bring back from town or thrice-annual expeditions to civilization. The latter required a seven-hour, 12-mile hike to the nearest road, tramping through dense rainforest swarming with biting sandflies and crossing three sizable rivers, one of which required a stashed canoe to safely navigate. This is not a recollection embellished by a child’s naïve memory–our hike out of Barn Bay took an entire day and included an hour of bush-whacking through thick jungle to connect to the trail, a waist-deep river crossing and trudging through multiple mud bogs (Casey did all this barefoot, naturally, having not bothered to bring shoes on the two-day trip). By day, the kids fended for themselves while Lou and Liz shouldered the burden of providing for the family and keeping the kids safe from extreme weather, the wild ocean and a swift-moving river. Independence was encouraged and the kids were allowed to roam freely, so long as they stayed back from the treacherous waves. They played music, drew, explored the jungle and learned to live off the land. Think “The Swiss Family Robinson,” minus the whole shipwreck part. AWAY FROM THE BAY By the time Casey was 6, Lou and Liz had split up and moved away from Barn Bay. They bought a 325-acre farm three hours away in Central Otago, where Casey and her mom lived, while Lou and the older kids traveled back and forth to Canada, eventually relocating there permanently. Casey struggled to adapt to life in Clyde, a tiny town of fewer than 1,000 residents–approximately 994 more than she was used to seeing every day. Wearing shoes felt weird and she didn’t fit in at school. “I hated it,” she says. “It was really hard going from not being socialized to suddenly being among town kids who have nice clothes and nice lunches.” They lived in a teepee and failed at growing crops in the arid dirt. After finally homesteading the farm with a mud-and-hay-bale cook shack, a garden, sheep, chicken and a horse, a grass fire tore through the area and destroyed it. Casey and Liz barely escaped. “We had to smash through fences because our driveway was on fire,” Casey says. “We got to the road finally and the fire truck was there idling; they thought it was too late to come rescue us.” They moved twice more before settling into a flat in a nearby town. When Casey was 11, Lou came to visit and moved her to Revelstoke to live with him and her siblings. 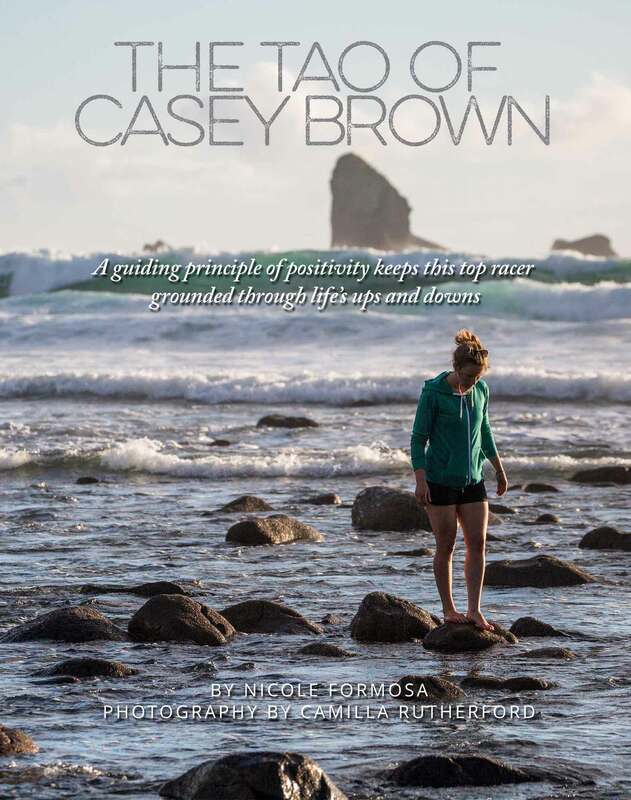 She was the last of the Brown kids to leave New Zealand and Liz was devastated, but the change proved to be a turning point in Casey’s young life. “There wasn’t much opportunity for me over here because we were so poor all the time. When I went over to Canada, we had mountain bikes, roller blades and toys and stuff. It’s like ‘Oh, this place is awesome. You go back here and it’s dull again.’” Not that Lou had abandoned his hippie tendencies–Casey’s high-school bedroom in Revelstoke was a teepee in the yard. As a young girl, Casey was more artistic than athletic–she drew, painted and played the cello–but in Canada she started chasing Lou and Sam and his friends around on mountain bikes (Casey still exercises her right brain regularly, as evidenced by the wood art and watercolor paintings smattered throughout her Instagram account). “When Casey came over here, she hated bikes,” said Lou, and she initially resisted riding with the guys, but “I think she felt left out a little bit. She had to get her skills together pretty quick to keep up with it.” And she did. Soon Lou could no longer stay on her wheel, and by chasing the boys, Casey developed the riding characteristics for which she’s become known: relaxed, fast, fluid in the air with unmatched style and the unique ability to evoke that addictive feeling of freedom that every mountain biker craves. But racing her bike wasn’t top of mind–she was more preoccupied with flying down the mountain on planks and won the BC Junior Freestyle Ski Championship in 2009. 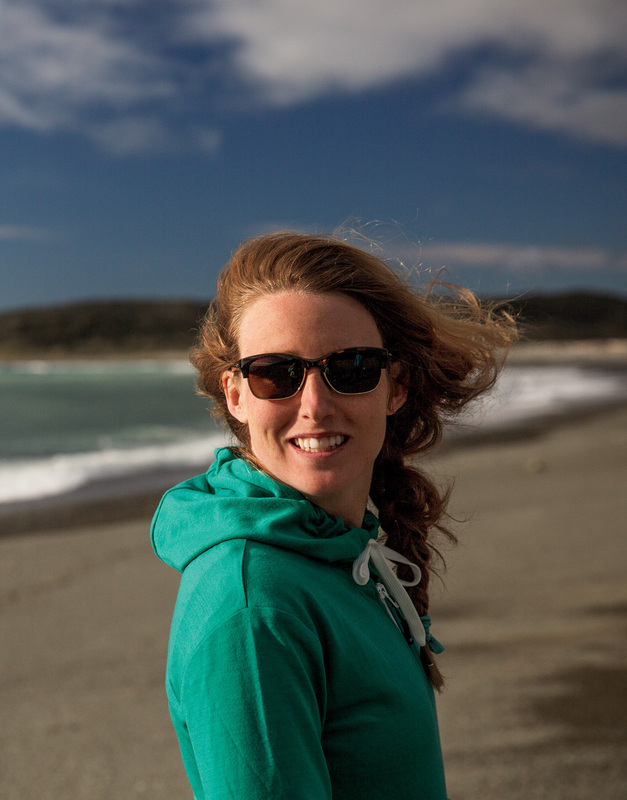 Throughout high school, she skied all winter and rode the Whistler Bike Park during the summer. She may have been content to keep balancing the two sports indefinitely. Then Sam died. THE GRAVITY OF GRIEF Out of all the kids, Casey and Sam were the most alike, Lou said, in their fair skin, spirited personality and exceptional athleticism. Liz concurred. The fact that Casey followed in his footsteps wasn’t surprising. “He was an amazing older brother,” she said. 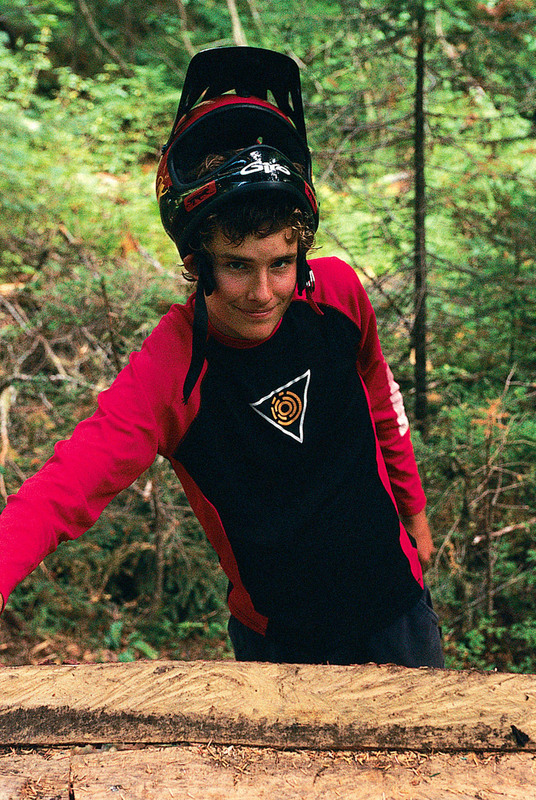 “They were very similar in the way they thought.” Even now, Casey’s unwavering admiration for Sam surfaces often in casual conversation–she mentions how he wanted to try BASE jumping with a mountain bike, laughs about how he used to clap his feet over his bars mid-wheelie or talks about her desire to finish a complicated wooden feature he had started building in the forest near Revelstoke. Mostly, she respects his legacy by living her life in a way that reflects his carefree and charismatic personality–posting grinning selfies with her missing front tooth or landing herself on the cover of The Ski Journal by launching a massive spread eagle in a retro one-piece ski suit. 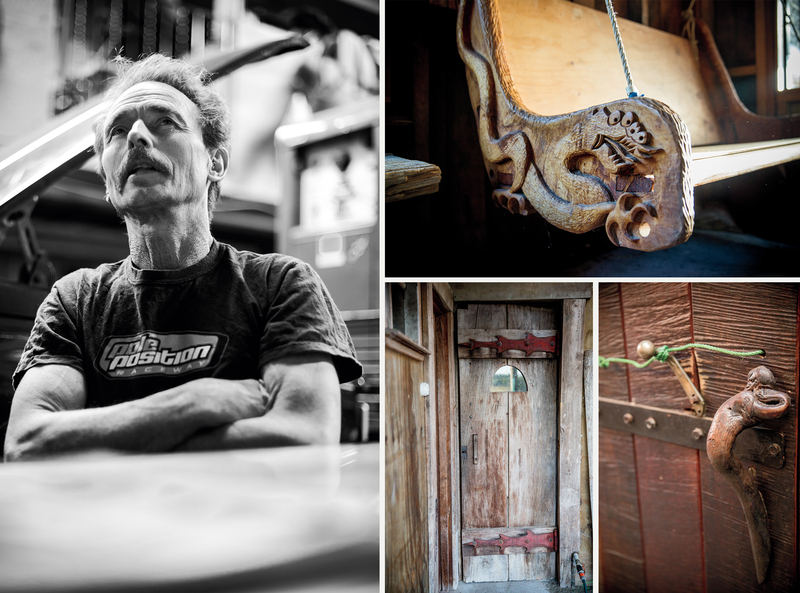 “From what little I knew of him, he was a charming, very likable guy,” says Bruno Long, a mountain-bike photographer and Revelstoke local who’s known Casey since she was a young teenager. “He was the kind of guy you wanted to be around. You look at Casey and she’s very similar. She’s got that same personality, she’s someone you want to be around and I definitely think she got that from him.” In the early 2000s, Sam rose to freeride fame from a segment in “New World Disorder III” that featured him riding his ‘disconstructed wheel,’ a kind of wooden hamster wheel he built in the forest near Nelson, B.C., that required precise balance to stay upright as it turned. He quickly became disillusioned with the ‘go-bigger’ mentality of filming and started heli-logging, then parlayed those skills into the lucrative marijuana-smuggling business. In early 2009, Sam, then just 24, was found hanging in his jail cell in Spokane, Washington, four days after U.S. drug agents arrested him for flying a marijuana-laden helicopter across the border. Sam’s death and the questions surrounding it shook his family to its core and Casey’s grief-stricken reaction was to turn to the bike. 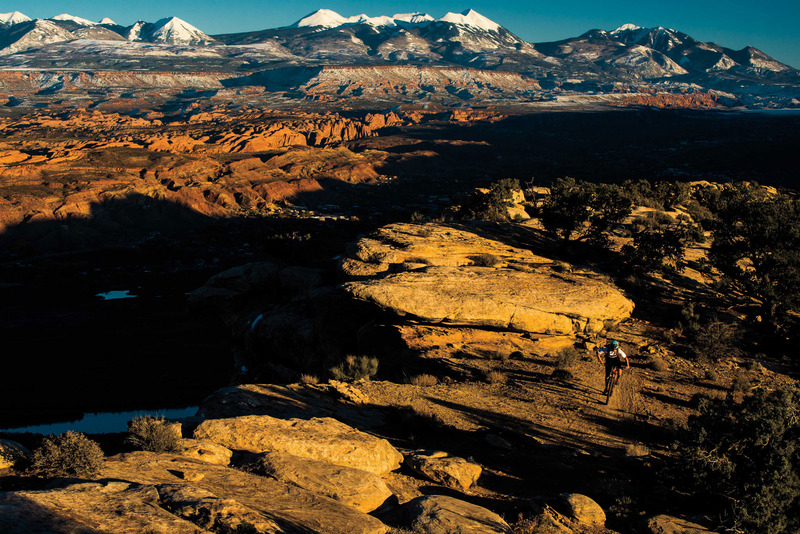 She quit competitive skiing and focused her attention on riding professionally. “I wanted to carry on what he taught me,” Casey says. “I don’t think I’d be doing World Cups if he didn’t die. It brought our family closer together. We ended up spread out as a broken family and his death taught us the value of being together.” Casey returned to New Zealand in 2011 for the first time since she had left a decade before and reconnected with Liz, and has stayed close with her sisters and her dad. 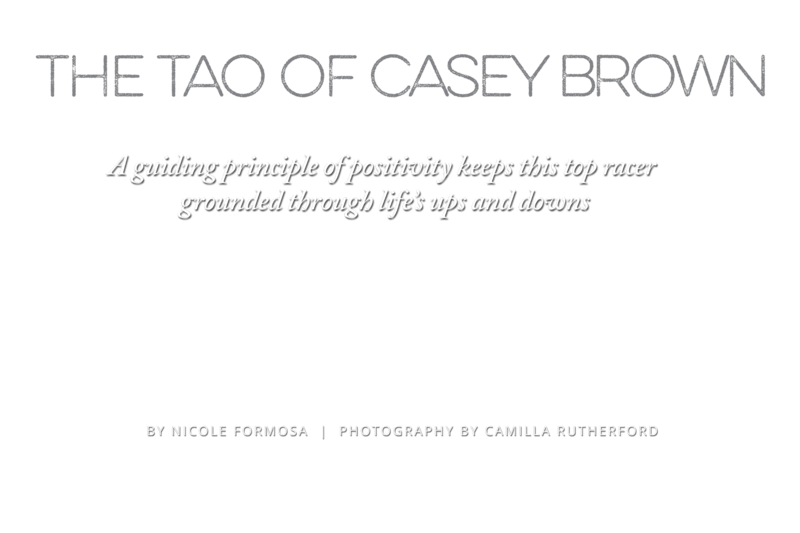 For the first years of her professional downhill career, Casey didn’t have a set training program and her grief sometimes manifested in painful ways–she pushed herself too hard and ended up in the intensive care unit for a week with a potentially fatal lacerated liver after crashing on her trail bike in a downhill race–but she also started showing promising results. It was enough to catch the attention of trainer Todd Schumlick at PerformX, who offered her a program that included two World Cup downhill races. 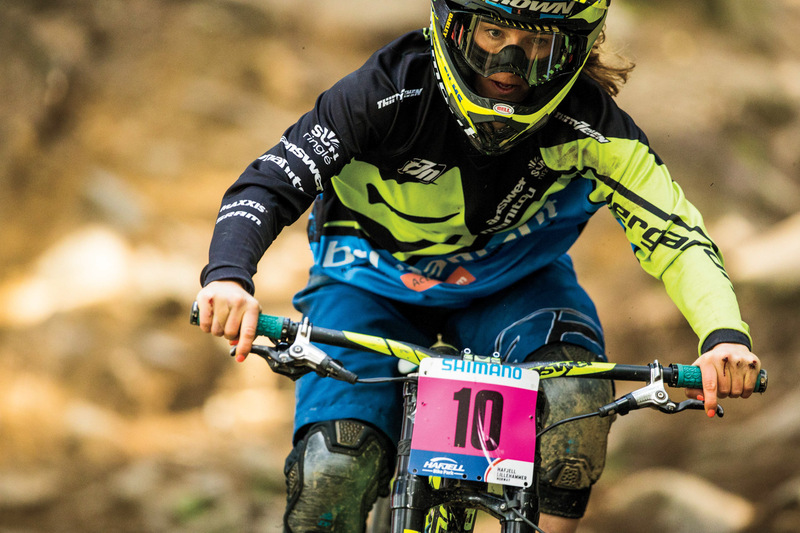 After training all winter, she placed 6th at her World Cup debut in 2012 at Mont-Sainte-Anne, followed by a 7th place at Windham, then capped the season with a win at the Canadian National Championships, a Queen of Crankworx title and a 7th at Worlds. Casey was hooked. That winter, she worked 85 hours a week as an electrical engineer apprentice to support a second season of racing. Under Team Dirt Norco, she competed in most of the World Cups in Europe in 2013, before breaking her collarbone at Canada’s National Championships. That injury barely slowed her down–she was back competing at Crankworx two weeks post-surgery. Norco folded its team the following year and Casey joined the Bergamont Hayes World Team, where she stayed for two seasons. During that time, she solidified her position as a talented World Cup racer, but faced challenges riding for a team that operated on a shoestring budget. The first year, the team traveled and slept in a dilapidated bus they nicknamed ‘Black Pearl,’ which yielded numerous absurd stories. Like when the team donned their full-face helmets as the bus squealed down steep European mountain passes, black smoke from the burning brakes filling the inside, just in case they had to bail out of an uncontrollable death machine. Or the time they installed vice grips to control the bus after the steering wheel broke off. It was entertaining, but perhaps not conducive to the mental focus and preparation required to podium on a world stage. And with a UCI rule change planned in 2017 that only guarantees TV time to top-five female racers, Casey’s vision for her competitive future started shifting. CHANGING COURSE At the end of 2015, Casey signed a yearlong contract with Trek Bikes, a deal that stemmed from her relationship with Anthill Films and one that brings a significant upgrade in exposure and support. “It definitely breathes a bit of fresh air into the situation,” she said in late December. “You kind of know they’re there for you. I went to Utah and Ray (Waxham, an engineer in Trek’s race department) met me there with all the gear and parts to make the bike work properly. It’s a whole different level of support. It makes you feel more important.” This season, Casey plans to compete in at least four Enduro World Series (EWS) races–she started strong in April with a second-place finish at the Cerro Catedral, Argentina, race–and possibly a World Cup or two. She also joined Trek’s C3 Project in Spain to film a segment for Anthill Films’ upcoming release “Not2Bad,” and will stick to her roots with another campaign to win Queen of Crankworx, an honor she last earned in 2014. She’s also signed on with Clif Bar as a helmet-logo sponsor, eschewing typical energy-drink deals to stay truer to her clean-eating beliefs. The arrangement with Trek meshes well with Casey’s riding personality–she can satisfy her competitive drive while also filming, shooting and traveling more. “I’d like to be more C3-oriented,” and, speaking before the March EWS season opener in Valdivia, Chile, Casey said she was looking forward to testing the waters at the EWS. “I’m kind of stoked to go to South America. I’ve never been there before. I’m just going to feel it out, see what the vibe’s like. If it works, it works. If it doesn’t, I’m not fazed. I’ll find something else.” Spoken like a true West Coast Kiwi kid. The new direction should also allow Casey to feed her adventurous side, another trait she and Sam shared, rooted in their footloose childhood. In person, Casey comes across as kind, humble and fun–and she is all those things–but a daredevil lurks underneath that sweet disposition. She talks about bungee jumping the world’s highest bridge jump or an upcoming skydiving trip as casually as most people talk about going to the grocery store. And her diminutive stature doesn’t hold her back from hucking huge gaps, charging the A-Lines with the same gusto as the guys–and looking more stylish than many of them–or practicing on an air bag to be the first woman to backflip her downhill bike. In Anthill Films’ “Death Grip,” she sped brakeless down the Savona trails in Kamloops at a terrifying 96 kilometers-per-hour. “That was one of the most nerve-racking shoots ever,” says Anthill producer and cinematographer Darcy Wittenburg. “She was so cool. She probably did 12 or more laps down it, always no braking, so she knew unless something disastrous happened, she would be fine. It was the most scared I’ve ever been on a shoot. I was on the top with her and could see her as she disappeared over the roll. It’s the worst I’ve ever felt watching a rider–it’s so much commitment.” “Death Grip” has tallied more than 828,000 views, the highest of any video in the Action Cam Dream Capture series. But Casey shrugs off the adrenaline-junkie epithet. “I was the youngest,” she says. “I think the youngest is always the risk taker.” To her fans, speed isn’t necessarily the main attraction–it’s how much fun she always looks like she’s having on her bike, which is because she is having fun. 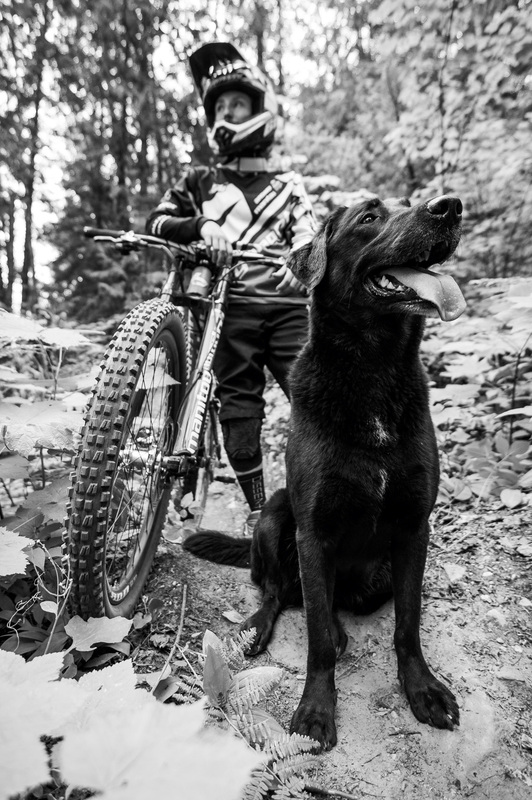 It doesn’t matter if she’s ripping her local Revy trails with her loyal labrador Snuff in tow, tearing down a World Cup course or sending the inebriated crowd into a frenzy at Crankworx’ Whip-Off Worlds with her signature amplitude and form, she appreciates every day she has on her bike and on this earth. “I think she looks at her brother’s life and how quickly someone like that can be gone. That’s why she lives life to the fullest and lets all the bad stuff roll off her back,” says Long. “You see her attitude and you can’t help but change your own attitude. It rubs off on everyone around her.” Casey’s endless positivity, approachable personality and propensity for sending it bigger than any other female on the circuit has also made her a crowd favorite. “She’s got a laidback bunch of fans that appreciate her attitude. She’s not smug about it, she’s not arrogant or those things that other athletes can be,” Lou said. THE LONG GOODBYE On the walk out of Barn Bay, we passed multiple landmarks that Casey and Jasmine seemed to remember as clearly as when they last left Barn Bay on foot some 17 years ago. Christy’s Hill, Cowpat Rock, Monkey Tree Corner, Egg Corner, Old Man Tree, Enchanted Forest–all names with a related story fueled by childhood imagination and a parent’s desire to preoccupy restless hikers. These and other tidbits on the property–a rope hanging from a tree with a rubber tire still attached, a tattered guestbook thanking Lou and Liz for their hospitality and the kids for the jungle tour–portray Barn Bay as a time capsule of innocence; a haven shielded from life’s harsh realities that would later come; the last time the whole family was all together and happy. Recently, the New Zealand government has talked about building a road through the National Park to Barn Bay. Casey worries that could open the region to tourism–or worse mining and drilling–marking the end of the pristine Barn Bay she knows. As in life, she did not waste any time during our days there last March. The first afternoon, she walked on the beach, examining rocks and shells, until the light dimmed. Casey had come up empty on pāua, but full of joyful childhood memories. 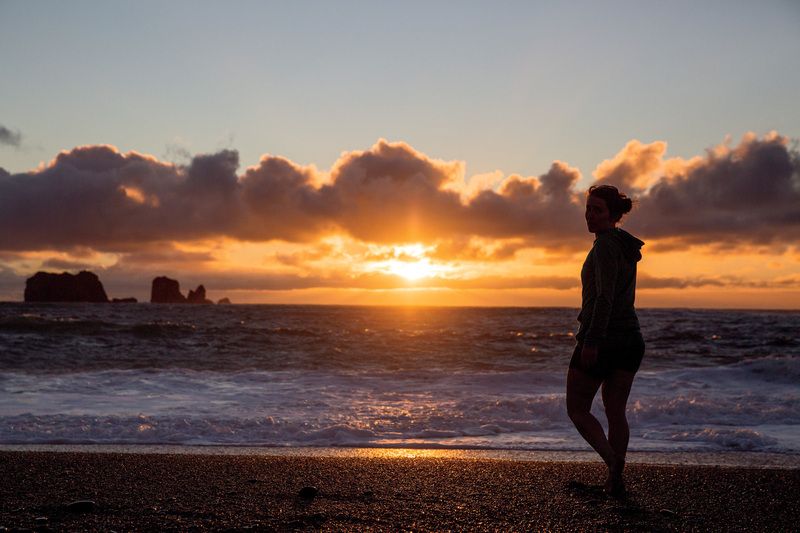 She turned to face the churning water as the sun dipped below the horizon, spread out her arms, breathed in the ocean air and lingered for one final moment.